The main part of the MIDIbox is the Microcontroller PIC16F874 (or PIC16F877) by Microchip. 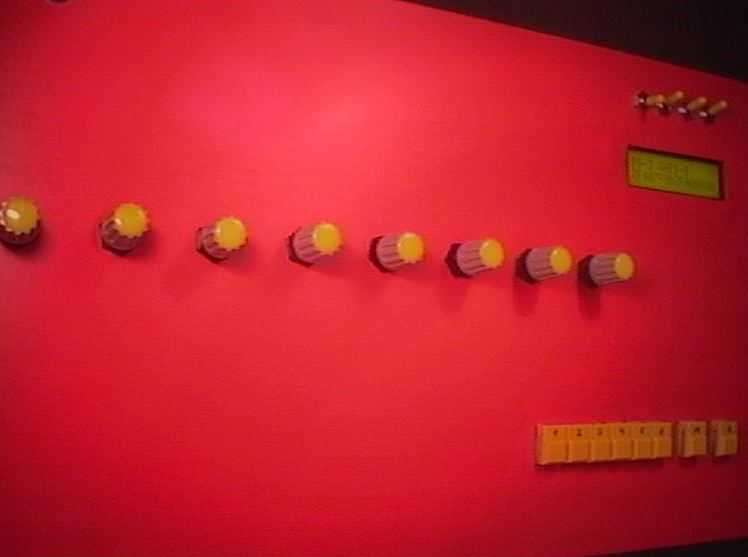 It is clocked at 20 MHz and offers enough performance to handle the potentiometers and to send MIDI data. 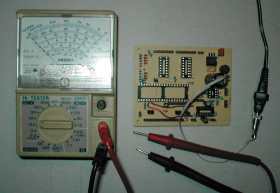 The internal 8 channel AD converter of the PIC is used to measure the voltage from the pots and convert it into digital data. By using external multiplexers, 16 pot channels are available. Also, a HD44780 compatible LCD (industrial standard) is plugged on the PIC. The software was extended by a lot of features in the last few years. Many ideas were suggested by MIDIbox users from all of the world, who use the box for the differentest tasks. The firmware is available as .hex file which can be burned into a PIC with a special programmer. Firmware updates are no problem, because the PIC includes a flash memory. 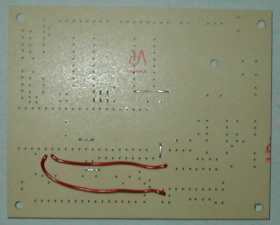 Its easy to build the Box, you can do it by yourself without much effort, if you know the right end of the soldering iron. To burn the software into the PIC, you need the PICplus programmer kit or one of the minimal programmer, which are available at the internet. Find more informations about this issue here. However, if you see no chance to program the PIC, I can do it for you. You only have to send me a PIC in a small parcel. This service is free, but don't forget to send me some stamps or about US $4 for shipping. The cheapest (but maybe most delicate solution for a beginner) is to build the MIDIbox Plus circuit on a vectorboard. 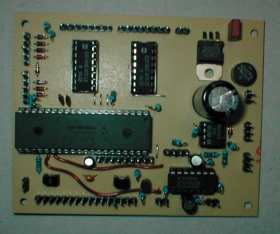 There are also some PCB layouts available which can be found in the download section of this site. In the meantime the PIC16F877-20 is recommended, since its availability has been significantly increased in the last months. It costs just one EURO more, but offers the double amount of memory. The MIDIbox Plus firmware is compatible with both chips. Only with a PIC16F877-20 it is possible to save 16 Snapshots, in the internal EEPROM of the PIC16F874-20 only 8 Snapshots can be stored (Snapshot=saved pot positions). And another argument for the PIC16F877-20: it is also used in the MIDIbox64, and a port of the MIDIbox64 firmware for the MIDIbox16 firmware can be downloaded below. Demo-Songs, that were made with AWE64, SBLive Value, Yamaha AN1x and the MIDIbox can be found at http://www.mp3.de/home/frequencies. midibox_plus_pcb_dave_v2.zip 45k PCB Layout made by Dave Wheeler. 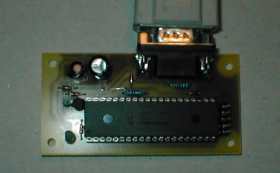 It is based on the old design; users who already made this board have to add an additional wire between Pin #23 of the PIC and the R/W input of the LCD like shown here. Note also that not all components are the same like in the redesigned schematic and in the orderlist! midibox_plus_pcb_shum.zip 75k PCB Layout made by Shum Siew Hung. It is also based on the old design, see notes above! midibox_plus_v1910.zip 50k Contains 4 firmware variants for 8/16 pots. Some words to the "bb" (BankButton) variant: it uses two bank buttons instead of the four bank switches on RB2, RB3. Two additional buttons on RB0 and RB1 enables you to send double note events (great for controlling programs like Cubase, Logic, Cakewalk via MIDI Remote). vmbpluspresets.ini 2k Preset file with for MPlus editor. Has to be copied into the same directory like the program. 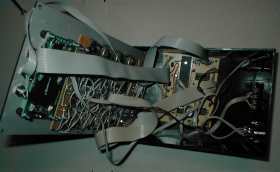 midibox_plus_hardware_tutorial.zip 6.8MB! This very professional Hardware Beginners Tutorial was created by Heico. It's written in german, but includes some pictures and videos which could also be interesting for people who don't understand this language. 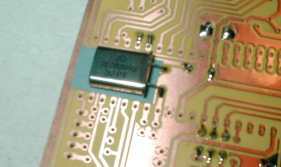 Note: it is based on the old design; users who already made this board have to add an additional wire between Pin #23 of the PIC and the R/W input of the LCD like shown here. Note also that not all components are the same like in the redesigned schematic and in the orderlist! 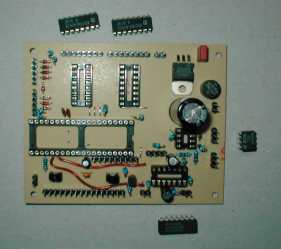 Today for beginners it's maybe easier to order a premade PCB (see below) - it will save your time. Here some instructions for the redesigned mplus_pcb_v1.brd (mplus_pcb_v1.gif) board which you can etch by yourself or purchase at "Mikes Elektronikseite". The components from this list can be ordered at Reichelt - for component sellers in other countries see this page. The exact location of the bridges can be seen here in form of red tracks. 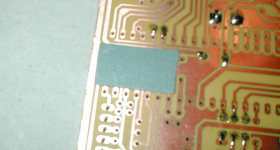 The 20 MHz crystal has to be soldered at the bottom side. Take care that the metal case doesn't get in touch with tracks; isolation can be ensured by using an adhesive tape (sticky tape, "tesa film") underneath the crystal. Solder the parts except for the ICs. Take care for the polarity of the diodes and caps (see PCB layout again)! If it hasn't been done before: now you should program the firmware into the PIC. Here a picture of the PIC programmer in action. 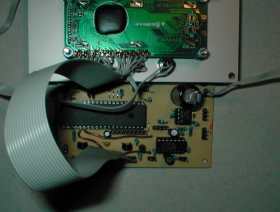 This picture shows how the (optional) LCD display has to be connected with a ribbon cable. With a "Displaytech 16*2 LCD" it's just a 1:1 connection, for other displays the order of pins may differ (refer to the appr. datasheet! ).